Picture it: You are a high school graduate ready to make “the big move” to become a college student with a college life, on a college campus, in college housing. You are ready to start a new chapter where independence and learning are your new way of life. You are ready! And you know what? We are ready for you, too! Living in the same campus environment where you learn makes your Hope education as complete as it can be. Living on Hope’s beautiful, 150-acre campus is an integral part of every Hope student’s experience. When you live in any one of our 11 residence halls, 13 apartment buildings, or 75 cottages, you are residing in the same campus environment in which you learn, making your Hope education as complete as it can be. You will be immersed in a social AND intellectual community, one that is both friendly and challenging. And that’s the point: a Hope education is a holistic education that includes residential life. Large windows and abundant natural lighting are a bonus in many of our residence halls. Imagine your life at Hope long-term, not just one term! 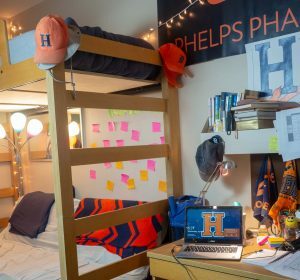 We encourage our students think beyond a first-year mindset and have a four-year perspective when it comes to housing because what makes living on campus at Hope so unique is your living experiences grow as you grow. 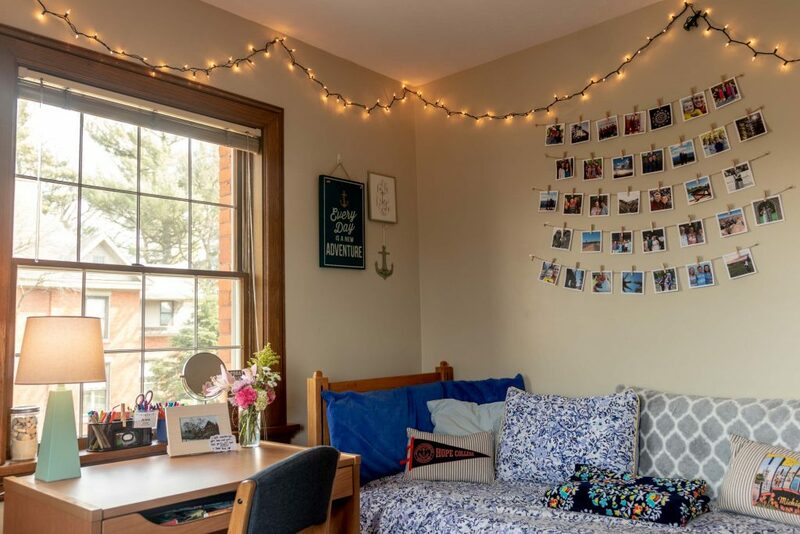 As you make connections and build relationships in residence halls during freshmen and sophomore years, you’ll be meeting people with whom you’ll want to share cottages and apartments with as juniors and seniors. 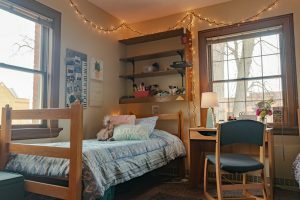 Usually by third or fourth year, you’ll be ready for a more independent environment yet you’ll still receive support from residential life, maintenance, and campus safety staff who are all committed to making your housing experience enjoyable. 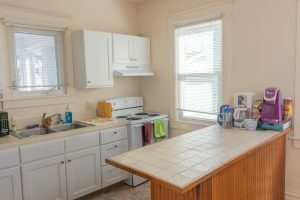 Example of a Hope cottage kitchen. Dining room inside a cottage at Hope. At Hope, our college-owned cottages and apartments are distinctive and varied. Some are larger. Some are smaller. Some apartments are downtown above local shops. Some cottages are historic homes. Some are themed for students who speak Spanish or French; for students involved in Campus Ministries or International Education; for Greek life; and, for students who participate in Emmaus Scholars, Phelps Scholars and Day1. As for residence halls, some rooms are doubles, some are triples, and some are suites. Most halls have a community kitchen, computer labs and a common living area. Whatever space you live in though, it is yours to personalize and call home. Our Hope RAs (resident assistants) are also there to give 24/7 care and support because they are Hope students, too, living right where you live. They’re there to ensure all our residents feel safe, included and respected in their campus home. Deposit-paid incoming freshman will receive housing information in late May. 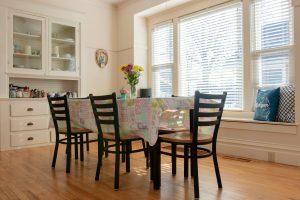 Roommate requests can be accommodated, but it’s usually not necessary to request a roommate. Our team works diligently with great care and attention to hand-match roommates from the information they provide on housing questionnaire cards. There is no random placement. A Hope education is a holistic education and that most certainly includes residential life. Still have questions? We have answers and are glad to help. Please ask us at housing@hope.edu. We want to make your move to Home Sweet Hope an enjoyable and memorable one.